- The threshold levels were determined following an international survey of cobalt concentrations in racehorses on race days. - A normal racing diet is more than sufficient to meet a horse’s nutritional requirements for cobalt and vitamin B12; neither cases of cobalt deficiency nor disease for which cobalt is the indicated treatment have been documented in the horse. - From evidence to date, as a guide, no more than 1 mg of cobalt from a single dose should be given by injection and no more than 5 mg by mouth within the day preceding race day. Local Rules regarding administration of Prohibited Substances in the period leading up to and including race day must be noted. - Injectable cobalt supplements offer no nutritional advantages because incorporation of cobalt into the vitamin B12 molecule occurs within the horse’s gut. - Trainers should consult with their veterinarians to ensure that their oral supplementation regimen provides only the amount of cobalt necessary to meet the scientifically established nutritional requirements of the horse for cobalt. The safest strategy is the selection of supplements with low amounts of cobalt, or not to use them at all. - Nutritional supplements should only be administered at the manufacturer’s recommended dose and frequency of dosing. The labels of such products should be read carefully every time that they are used. 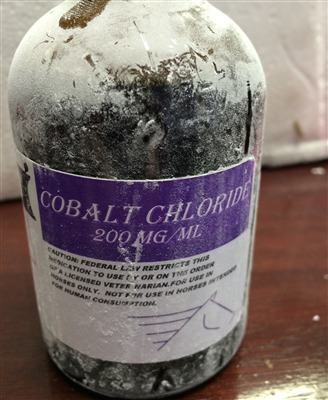 - Many products have not been evaluated to determine if they affect cobalt concentration in the horse. The use of unregistered, inadequately labelled supplements containing cobalt risk breaching the thresholds and is extremely unwise. - Vitamin B12 contains cobalt; the simultaneous use of multiple supplements containing cobalt and vitamin B12 risks breaching the thresholds. The administration of supplements constitutes a Treatment as defined in Article 6D and must therefore be recorded in accordance with National Authority Rules.